Human drivers are so 2017. Audi is looking toward the future of mobility with both products and engineers. 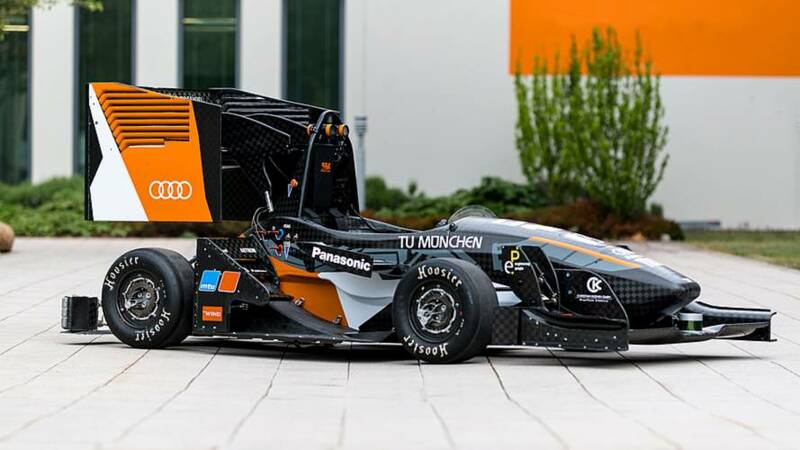 The German automaker will have a presence at the 2018 Formula Student Germany event in Hockenheim, Germany where students and young scientists from 23 countries will compete in several categories for points. Audi will be there focusing solely on the “Formula Electric” and “Formula Driverless” categories with three teams of students. The teams will seek to win points in “the disciplines of costs and manufacturing, engineering design, energy efficiency and acceleration,” according to the automaker. Audi has enormous plans for autonomous and electric production cars. The company hopes to launch more than 20 electrified models by 2025. The automaker is also planning to produce its first autonomous car by 2021, basing it off the Audi Aicon concept car. Part of the development includes experts from 25 countries developing autonomous driving technology at the Munich-based Audi subsidiary, Autonomous Intelligent Driving. The company hopes to bring up to 600 experts on board to help develop the technology. While autonomy is the way of the future, that doesn’t mean the Audi-backed race cars won’t fit a human behind the wheel. The photo of one race car Audi is backing appears to have a seat and seatbelts; however, that doesn’t mean the person will be doing any driving. The human is probably a fail-safe in place just in case the driverless car decides to go rogue. The mobility of the future is electric and automated. That trend is also reflected in this year’s Formula Student Germany (FSG) event in Hockenheim. Audi’s focus there will be solely on the “Electric” and “Driverless” categories. On August 6, three teams of students will be out to collect points for the brand with the Four Rings, in the disciplines of costs and manufacturing, engineering design, energy efficiency and acceleration, among others. The young design engineers will meet 3,500 other young scientists from 23 nations. The four racing cars that were designed with the help of the Four Rings will this time compete in “Formula Electric” and “Formula Driverless.” Together with the TUfast Team from Munich, the Schanzer Racing Team from Ingolstadt and the University Racing Team from Eindhoven, Audi is thus deliberately focusing on the most important technologies of the future. Within the context of the “Audi.Vorsprung.2025” strategy, the company has set itself the goal of becoming the leading premium supplier in the field of electric mobility. Audi intends to launch more than 20 electrified models in close succession by 2025. And the car manufacturer plans to produce the first autonomous electric car based on the show car Audi Aicon by the year 2021. Top experts from 25 nations are already working on the development of technology for autonomous driving at the Munich-based subsidiary, Autonomous Intelligent Driving GmbH. In the medium term, the Audi subsidiary plans to bring up to 600 experts on board. “We are currently experiencing great dynamism. Young engineers and IT experts therefore have the best opportunities to think ahead and to shape change also at Audi,” added Antje Maas. At Hockenheim, FSG participants and visitors will be able to learn more about the innovative jobs on offer at Audi in a personal dialog. Personnel marketing advisors will be available to talk to at an exhibition stand in the FSG Forum. In addition, interested parties will be able to meet professionals who are developing autonomous driving at Audi. Furthermore, experts from the company will once again be in the pit lanes and on the track as jurors, to support the student teams with advice and plenty of experience.